In the new comedy The Spy Who Dumped Me, Audrey, played by Mila Kunis, laments that she's never been to Europe. Later, during a moment of crisis when her life is on the line, her friend Morgan, played by Kate McKinnon, asks her, "You wanna die having never been to Europe? Or do you want to go to Europe and die, having been to Europe?" Soon, the two characters inadvertently get caught up in an international espionage scheme, they travel to Vienna, Prague, Paris, and beyond, drawing undue attention at every turn. 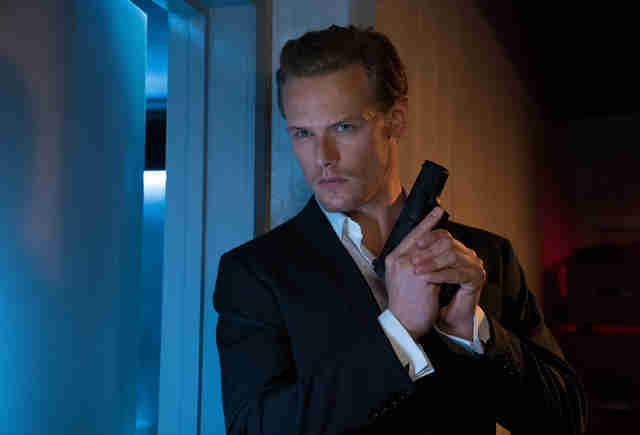 Helping out the trouble-magnet gal pals is a dapper MI6 agent named Sebastian, played by Outlander's Sam Heughan. 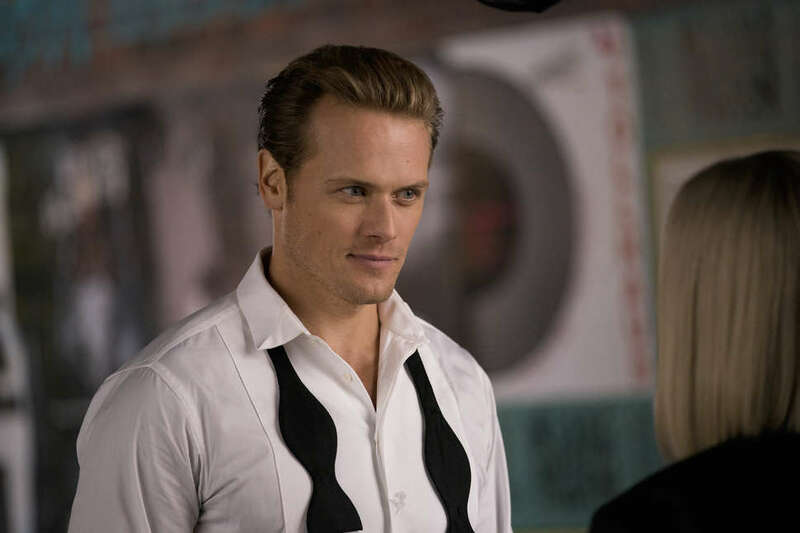 Thrillist talked to the Scottish actor about gallivanting around Europe, becoming addicted to escape rooms, and those rumors that he might replace Daniel Craig as James Bond. Thrillist: Is the life of an actor who gets to go to all these amazing international locations at all like the life of an international spy? Sam Heughan: [Laughs] Yeah. But no, there's really not much danger. We have incredible stunts and stuff, but it's great. We went to Budapest, Vienna, Amsterdam, and Berlin, and we were filming in these fantastic locations. Amsterdam is a great, great city to explore. We were really lucky, actually. Every country we went to, we managed to get out and see a bit on our weekends off. The largest lake in Central Europe is in Hungary, Lake Balaton, and I went there for a couple of days, and went paddle-boarding and swimming. There are some fantastic places to go around there, and some great vineyards, so I went wine-tasting as well. It was the height of summer, so it was a really nice time to spend in Europe. And Budapest, where we shot most of it, they had so many beautiful buildings; it can double for so many other cities. This was my first large movie, so it was fantastic to be given the opportunity to travel like this. We even flew on a chartered airplane from one country to another, which was a first for me! I hear you had another first while bonding with the cast -- your first escape room? Heughan: [Laughs] I did! And I can tell you that Hungary is where escape rooms first originated, so there are a great many there. [Director] Susanna Fogel instigated it, because it's very much her personality. And David Iserson, who co-wrote the script, he's a huge aficionado. They're pros at these, and they're very, very clever. They're very intellectual, fun people to be around, and they took us to one early on, to help the cast bond, and this kind of stuff helps. It really helps create relationships. We had a really great time. It was hysterical, and a lot of fun. 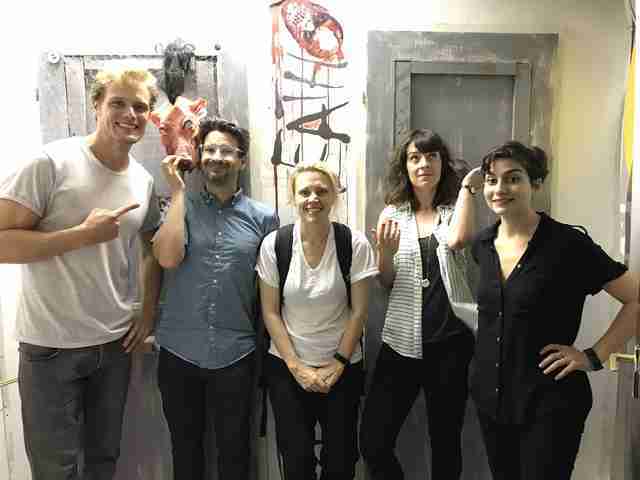 Who doesn't want to get locked in a room with Mila Kunis and Kate McKinnon? Who was the best at figuring it out? Heughan: Kate's not so great in confined spaces, so Mila took charge, and she's very good at being commanding, and she certainly whipped us into shape. Kate and I, our position was pretty much to panic, mess around a bit, and not take it too seriously. And I'm more of the cheerleader. I'm the one there in the background supporting everyone, in between my moments of fear! So we had a really good team, I think. And we managed to escape! [Laughs] And since then, I've done quite a few, actually. I'm hooked. I did one recently in New York, which was a disaster. [Laughs] But it's so fun. If you do an escape room, you should really do it with Kate. It's great. When we first meet Sebastian, it's hard to tell if he's a good guy or not. Especially when he pulls a gun on Audrey in the Vienna café. Well, in the film, it's Vienna, but you actually shot it in Budapest? Heughan: It's supposed to be like the famous Café Sacher, which is a place you can go to today in Vienna. They have this famous cake there. But yeah, during the first act of the movie, Sebastian is charming at first, but it's hard to tell which side he's on, and whether we should believe him. So when he turns up, just out of the blue, at the café, I wanted him to appear kind of intense. He's just there to do a job. He doesn't want to hurt anyone, but he's also going to do his job, and do it with complete and utter conviction. He's not going to let anyone get in his way. But I think we see he's also not as used to the field as others are, so when he gets out there, he maybe goes a little too far. He still has a lot to learn, but eventually he learns a lot from the women. They become just as good if not better than he is. What was it like shooting that glorious action sequence that follows? Susanna said that after Red Sparrow shot in there, they were tearing down the café so they could renovate the building, and they offered it to you to destroy first. Heughan: I didn't know that! That's fantastic. I do enjoy destroying things. That was actually the very first thing I shot. And we shot it over a number of days, because it's a very big sequence. I worked closely with Gary Powell, our stunt coordinator, and the whole stunt team, and you rehearse it, like any action scene, sort of bit by bit, and then the whole of it. It was pretty intense, because it was a lot of moving parts, and all this extra stuff -- coffee machines blowing up, people getting stabbed and shot and knocked over, everything breaking. So Gary was really in his element, and the stunt guys really went for it. They really wanted it to be impressive. And so it was great to be able to fit in to that as much as possible and sort of show what I could do. We didn't have a hell of a lot of time to rehearse it. Maybe a few days before we started shooting? So it was great to start right away with a big action scene. I absolutely relish that stuff. It's something that I really enjoy, and would like to do a bit more of. Maybe with less cake next time? A little less cream. I was watching Atomic Blonde the other day for the first time, and it kind of ruined it for me because every time I saw someone I recognized, I knew they were going to die -- because they were one of our stunt guys. So I was watching Atomic Blonde going, "Well, that guy's going to die... And that guy's going to die..." Ugh! But I guess it's the same for me watching Game of Thrones, because in the U.K., we use a lot of the same stunt teams there, too. But usually it's hard to spot, especially on the period stuff, they're in a wig. And stunt guys usually try not to show you their faces. Now that you have a little spy experience under your belt, what do you think about the James Bond rumors? Do you think you'd make a good Bond? Heughan: I think I could play any part! And obviously this is a nod to those movies, but you'd approach a straight character like James Bond with a completely different mindset. But in a way, thinking about it, Sebastian, we wanted to make his world real. We didn't want to send it up too much, so the women were in a very real situation, so I guess there's a bit of a transfer in that part of the character. But if I were going to play Bond, I'd ask for a much faster car! [Laughs] A bigger, faster car, and a whole lot more suits. A whole wardrobe!